Arinella´s is a Rattery located in Sweden, Europe, and was founded in 1985. This is also the year I had my first ratlitter. 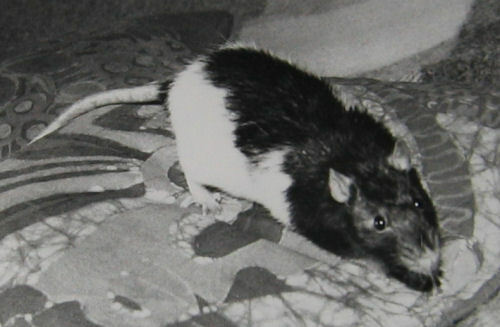 I had my first rat 1983: a Black Hooded male called Pim-Pim. 1988 Arinella´s became a registrated breeder in the Swedish Rat Club, SRS. I have been a member and a registrated breeder in SRS - The Swedish Rat Society - since 1988, accept a break from being a registrated breeder in SRS April 3 2009 to September 20 2012. Year 1988 - 2000 I concentrated in breeding Standard rats in Self Black (main goal), Chocolate, Mink and Seal Point Siamese, but when the temperament went wrong in 1999 I had to rethink my whole etic and breeding rules. I loved the active and hypersmart rat, and trained Agility with my rats 3 hours a day. But that was to active rat to breed on. So I started from scratch with new rats and did a full renovation of my own ground rules for how a rat's temperament must be, to people, other rats, in stressfu situations, etc. It was a hard time for me. I now was gonna breed ONLY on temperament. A thing no-one did in the Rat Club. I bought new rats from Eva Johansson. These rats decended from the test-mating she did with Graphite and Russian Blue Juli 1999. I never paid attention to color and only breed for temperament and health. Whenever I tried to breed color - Graphite - always bad thing happend. And I had all colors in my strain. It was real messy. But of course, they had the best temperament and were so nice and beutiful. Year 2000 - 2009 I breed only for temperament. Goal was Graphite-colors in Self, Agouti, Pinkeyed, Rubyeyed and so on, but main thing was temperament and health. 2009-2011 I had a bad personal time so I stoped being active in SRS. I was a member still, but didn´t want to be a registrated breeder. Summer 2012 I didn´t have many rats from my strain left. One Graphite male and one Black Hooded heterozygot for Graphite... And no females. I thought through the situation and decided to try to raise Graphite really serious one last time. Since no-one else had done it for a long time. I found some females. And here I am. My name is Gerodean "Grodan" Elleby. Grodan means the Frog (Froggy). I've been called the Frog since I was a little toddler, crawling on all fours. Today I am an adult and do not mind to be called Gerodean. I have always had animals around me like frogs, horses, rabbits, dogs, degus, fish, cows, chickens, etc., but when I met the rat I was stuck. For me it was the perfect pet. Right now I live in a small house in a small village called Bettna. It´s located about 100 kilometers from Stockholm. The plan is to move closer to Stockholm, where I feel most at home, eventually. Besides rats, I have mice (Morakullan´s Mousery) and two ferrets. I had a brown Doberman male for 10½ years, he was put to sleep in the age of 11 years and 7 months 17 of June 2013. 1997, I wrote a book about rats: The Amazing Society Rat. There was no publisher interested in publishing it so I copied it just up a few copies. It ended up in the library and there were a few years. SRS also sold a few copies, and my crude buyer could buy a copy. It was a very small edition. The book was about 72 A4 pages and 30,000 words. It took about two years to write it. Today it´s a rather outdated book with a variety of gaffes and I have not been able to translate this because it requires a lot of factual examination. And I was burned out in 2005 and has not been able to write longer texts since. Despite this, the book is used as a source today, unfortunately, is rarely specified source. Since 2006, I run the mouse community mus-ifokus. My goal (new 2012) is to breed Graphite colored rats in Standard ears and Dumbo ears. Also Standard coat and Rex coat. Graphite is a blue color very similar to Russian Blue found in Germany by Anja Weidt 1994. Testmatings between Graphite and Russian Blue and Blue has been done 1999 in Sweden. Other names for Graphite is German Blue. In Germany they call the color Graphit. 2017: I have lost the gene for the colour Graphite and now only have Russian Blue.